Spain is officially in recession—the second in little more than two years. Unemployment has soared to nearly one quarter of the population (over half of the youth)—the highest level in almost two decades and far worse than predicted. Fears the government will not meet deficit-cutting targets agreed with the European Union and International Monetary Fund have pushed up its borrowing costs. There is also growing speculation that bank debts are much higher than admitted. “It’s a very challenging situation. I don’t think that the banks are cornered yet, but the government must come out soon to say how they will address them,” Deutsche Bank economist Gilles Moec said. As a result, credit ratings agency Standard and Poor’s downgraded the country’s credit-worthiness and further downgrades are likely. Prime Minister Mariano Rajoy said he was determined to stick to austerity measures. His government has slashed spending by 42 billion euros this year, equal to some four percent of economic output. As a result, social conditions for the majority of the people of Spain are fast approaching those in Greece. Youth are bearing the brunt. A popular new word appeared in the Spanish vocabulary as the effect of the 2008 crisis began to be felt—”Mileuristas, the thousands of young people who were forced to accept jobs that paid just a thousand (mil) euros a month. That has now been replaced by “nimileuristas”—those not even paid a thousand euros. Sociologist and expert in youth and precariousness, Esteban Sánchez, said, “Every indicator has worsened… every single one”. “Extremely high unemployment, high rate of temporary employment and very low wages. It has been horrendous. There is not a single datum that allows us to hold any kind of positive outlook,” Sánchez continued. Rising unemployment, the lack of jobs and the prevailing conviction that the economic crisis is going to continue for a long time and get much worse has resulted in people leaving Spain in droves in the hope of finding work elsewhere. Between the months of January and March, 27,004 people left the country, more than double the numbers who left in the first quarter last year. Of the people who remain, four out of ten of the 4.77 million unemployed don’t receive any economic help whatsoever; 1.4 million will receive unemployment benefit of just 865 euros a month for a minimum of four months and a maximum of two years and another 1.6 million get different types of subsidies amounting to a miniscule 426 euros a month for the duration of between six and 18 months. Many people are forced into different types of “training” jobs where they do full time work at training level payments. The labour cost per hour in Spain has plummeted to 23.3 percent below the European average. According to the report, “Exclusion and social development 2012,” issued by the Fundación Foessa of the charity Cáritas, poverty in Spain is “more extensive, more intensive and chronic than ever before”. The percentage of Spanish homes below the poverty threshold is 22 percent and a further 25 percent are in an “at risk situation”. In other words, nearly half the population are living in or close to poverty. 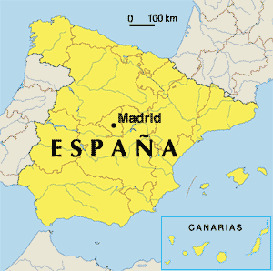 It is reported that of the 84 million poor people in the European Union, 10.7 percent of them are in Spain. Cáritas General Secretary Sebastián Mora commented, “The constant increase in inequality and the wage gap between the rich and the poor, which widened enormously at the beginning of the crisis, threatens to continue increasing, which will lead to the polarisation of society”. Mora added that one third of Spanish homes find serious difficulties in making money stretch to the end of the month and that it is families with youngsters and minors who are most affected. There are marked differences according to regions: the poverty index in Navarre, in the north of the country is 7 percent, while in Extremadura it is 38 percent. Mora added that in 2010 the charity had given help to one and a half million people badly in need, 20 percent more than the previous year. Homelessness is on the rise because evictions are increasing and mortgages are becoming more difficult to get. Although the value of houses has dropped by nearly 29 percent since 2007, the number of mortgages has gone down by 45.7 percent. The government has cut the amount of money provided to the municipalities for the care of elderly people at home and has forced pensioners to pay 10 percent of the cost of their medicines, which were previously provided free. This will affect eight million old people. Charges for medicines are also being increased by 10 percent for the rest of the “active population”. New legislation has also been passed that makes it more difficult for immigrant workers to access medical care. While in the past a certificate of residence was sufficient, now they will have to produce documents that prove their “fiscal right” to live in Spain.